Pageant Fashion: Wrong? or Revolutionary! Its been a few weeks since the Miss Bahamas Organization crowned its three Queens – Miss Universe Bahamas, Miss World Bahamas, and Miss Earth Bahamas, but the competition isn’t over yet! Those young ladies are just beginning their reign and now have to compete on the international stages for their respective titles. The pageant was just as you may have imagined it: introduction, entertainment, winner announcements, eliminations, final q and a, then the crowning. The norm. But it was the fashion of the attendees that made the night more interesting than who will be crowned Queen. Showing their support was former Miss Universe Bahamas queens Celeste Marshall and Lexi Wilson. They both wore beautiful evening gowns that could compete on the stage that night rather than sit in the audience. Celeste wore a coral red strapless gown with embellishments around the waist, and an exaggerated pleat at the back of the dress. Lexi wore a white long sleeve backless gown, with sequins above the hips and a subtle train. Co-Host of the Miss World Bahamas Pageant Ianthia Smith shined on the red carpet and stage in a metallic sequined dress with a sweetheart neckline and side split. Not to be outdone, the men attending the pageant also showed up in style. Zhivon Young, Miss Bahamas Organization Director of Event Planning wore traditional black and white, however with an off black textured jacket and slim fit black pants. 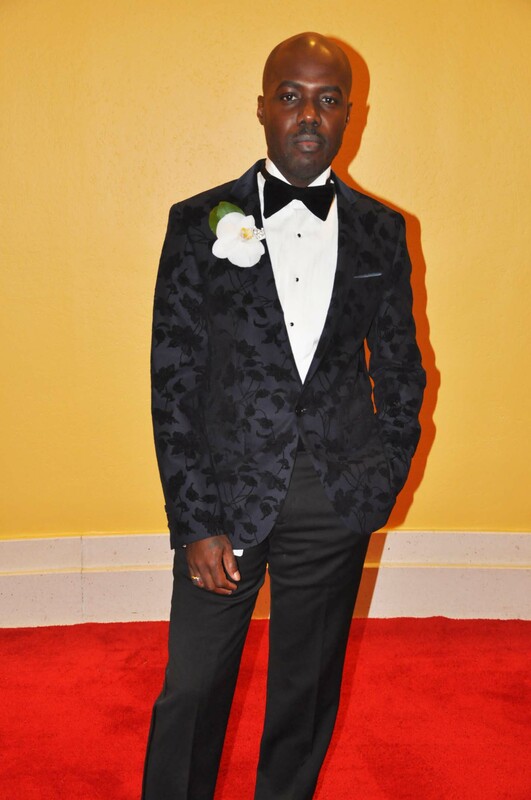 He added detail to his ensemble with an oversized flower as his lapel pin and a large black bowtie. 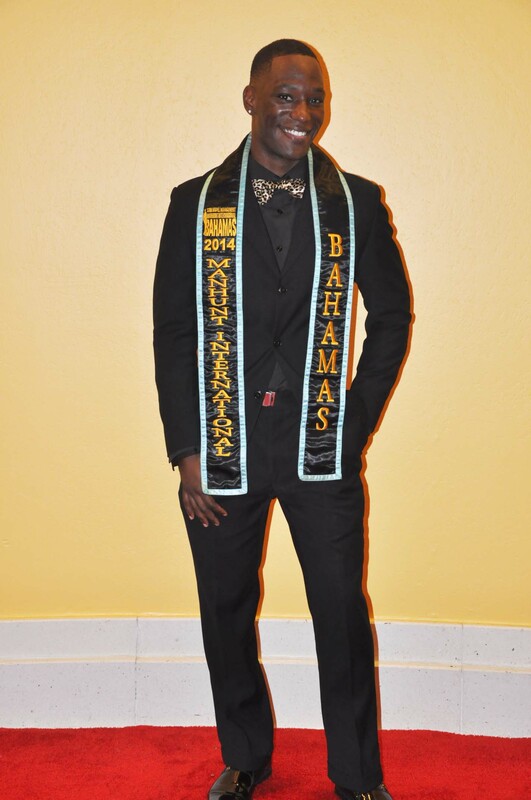 Mr. Manhunt International Bahamas 2014 Davin Johnson went for a black on black ensemble, adding a small leopard bowtie for detail and donning his title stole. Most attendees wore gowns and formal wear, like myself, who wore a vintage Herc & Lisa Fall Collection gown by Bahamian designers Cardell McClam & Christopher John. However, others opted to dress simpler. 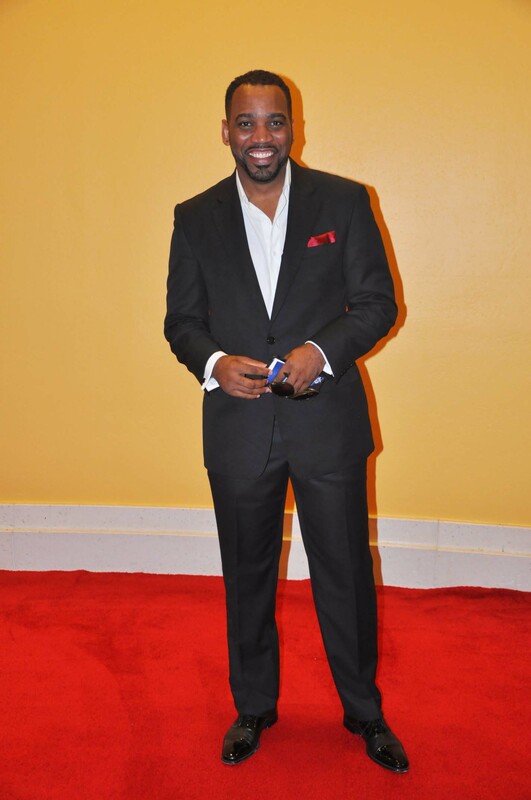 Mr. Addis Huyler, CEO of SIDDA Communications Group opted for simple but classic, in white and black with a red pocket piece, no necktie, now bowtie. While others opted for a more avant-garde look. Take in this ensemble for example, who would’ve thought to wear fringe and a brim hat to the pageant. Very unconventional, but is this wrong? Or revolutionary? Its been the norm for pageant attendees to dress formal: gowns and tuxedos. However, recently its becoming clear that the audience is leaving the formal to the queens and bringing the fashion to the red carpet. Who cares about a Dress Code… when there is Personal Style! ← Flat Chest at it’s Best!